In 2003 I was living in a 2200 square foot house, it was packed with all my stuff, and I had a 12×20 shed that was packed too. In 2006, I moved to an 1850 sf house, got rid of some stuff, but the garage and same shed were still packed. In 2011 I moved to Tampa, rented the historic bungalow of my dreams, 900 sf with a one car garage. That is all packed with stuff. You have so much stuff, some of it has to go into plastic bins on the porch. Then you cover it with tarps and it sits for a year. After it sits for a year, you think you can get rid of it and you won’t miss it, but as you go through it you find trasures you think you need to keep. Well, sometimes a force of nature like an iceberg, or in my case, a tropical storm, make you have a Titanic moment. I had set aside last week to go through and throw away most of the stuff from the 6 bins piled on my back porch. As I pulled off the tarps, I found that four of the six bins had not made it through Tropical Storm Debby last summer. They were still full of stuff, most swelled up, mucky and unrecognizable. So it was a pretty easy decision of what to get rid of. I found Matthew’s old marbles and Matchbox cars and they were ok, but papers, books, photos, science projects, pretty much just “stuff” was unsalvagable. 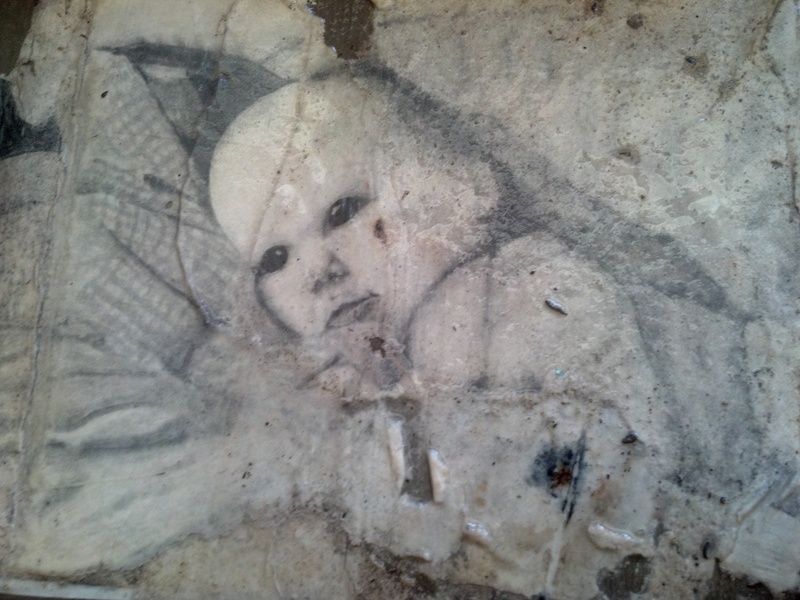 Then out of the muck at the bottom of one of the bins, I had my “Titanic moment”, the discovery of a long-forgotten drawing of Jessi I did when she was 2 months old. Unlike James Cameron and Bill Paxton, I was not able to save it, but I did get a few pictures (digital!) of it before it went in the trash. And unlike Jack, I’m still around to draw another if I really need one.